From 12 September, 12 Sixth Form dancers, musicians and actors had the fortunate opportunity to work with the Temper Theatre Company to create a performance piece, Kin, which will be shown on 17 and 18 October. Temper Theatre Company are a physical theatre company who create work inspired by pressing socio-political and environmental issues. Using dance, realism, ensemble movement and complex immersive sound and lighting design, their work explores stories designed to resonate with contemporary culture and evoke a meaningful, individual response among diverse audiences. We began to devise Kin with the consideration of the universally relevant themes of global warming and the impact of social media. It was inspiring to learn from Temper Theatre Company members Jack and Finn, who are acclaimed theatre creators and performers, and are currently on tour with their show Nighshifter in London. Book tickets for this year’s Sixth Form Show, Kin. 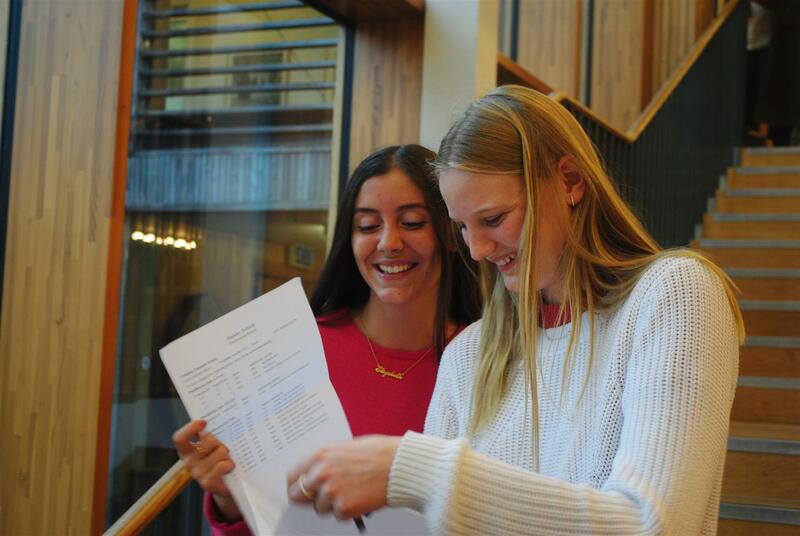 Bedales students have achieved strong A Level results for 2015 with the school’s highest ever percentage of A* grades at 15.5%. They have secured places at universities including Oxford, Cambridge, London School of Economics, University College London, Edinburgh, Bristol, Durham, Glasgow, Exeter, Warwick and Berklee (US). 43% of all grades were A*-A and 72% at A*-B. Seven Bedales students have secured places at the Universities of Oxford and Cambridge on courses in Medicine, Chemistry, Biochemistry, English, Philosophy, Politics & Economics, French & Religious Studies, and Fine Art; four have done so through this summer’s grades and three students from last year’s cohort received offers based on their A Level results from 2014. Four of these seven students were taught at Bedales Prep, Dunhurst, before progressing to Bedales Senior School and Sixth Form. Poppy Duncan from Stroud, Petersfield will read Medicine at New College, Oxford having achieved three A*s in Biology, Chemistry and Mathematics, and an A in Further Mathematics; Chloe Green from Liss achieved three A*s in History, Mathematics and Further Mathematics, and an A in Chemistry, and will read Chemistry at Worcester College, Oxford; Peter Price from London achieved three A*s in English Literature, History and Religious Studies and will take up his place at Corpus Christi, Cambridge, to read English;Juliette Perry from Petersfield gained an A* in History and three As in Chemistry, English Literature and Mathematics, and will take up a place at Somerville, Oxford to read Philosophy, Politics and Economics. Sophia Falkner from London achieved four A*s in Economics, German, History and Mathematics; to study Economics and Economic History at the London School of Economics.Oscar Braun-White from Rowland’s Castle achieved three A*s in Physics, Mathematics and Further Mathematics and an A in Classical Greek; to study Natural Sciences at Durham University. Sophie Mills from Rowland’s Castle achieved three A*s in Chemistry, Physics and Mathematics, and an A in Further Mathematics; to study Chemistry at the University of Warwick. Thomas Higginson from Chilworth, Southampton celebrated his 18th birthday on results day with three A*s in Dance, French and Psychology and an A in Mathematics; to study Dance at The Place, London. Head boy, Rob Miller, from London achieved two A*s in English Literature and Mathematics, and an A in Latin. Head girl; Margaret Rice, from Bampton, Oxfordshire achieved an A in Religious Studies and two Bs in Classical Greek and Latin. Christi Van Clarke from London achieved two A*s in Drama and Theatre Studies, and Art and Design, and an A in French; to study a Foundation Diploma in Art and Design at City and Guilds, London. Deputy head boy, Roly Botha, from the Isle of White achieved three Bs in Drama and Theatre Studies, English Literature and Religious Studies; to study Drama and Theatre Studies at Royal Holloway. Roly was also awarded the school’s Gabriel Bruce Award for outstanding work in Theatre, Art and general contribution to the community. 22 Bedales students have been accepted at British art schools. Many schools find that only a select few of their art students choose to apply to leading art and design colleges and universities. The one-year Foundation Diplomas in Art and Design allows students the experience of further developing practical and conceptual skills in preparation for art and design related degrees. Olivia Brett from Petersfield who will read Theology and Religious Studies at Clare College, Cambridge. She is currently performing as Nannetta in The Black Cat Opera Company’s performance of Verdi’s Falstaff at the Camberley Theatre has also been awarded a choral scholarship at Clare College. Rufus Rock, head boy in 2013/14, from East Meon, who will read Fine Art at Brasenose, Oxford. This year he has taken a six month practical filmmaking course in Berlin and also learnt German. Joshua Grubb from Petersfield, who will read Biochemistry at Somerville, Oxford. He has spent this year working for Procter and Gamble in their science research labs at the Newcastle Innovation Centre as part of the ‘Year in Industry’ scheme. He was also awarded a Distinction in his Diploma (Dip.ABRSM) Clarinet examination. Mona Fu from Zhuhai, China achieved two A*s in Mathematics and Art and Design, and an A in Physics; to study Architecture at University College London. Jojo Mosely from Hambledon achieved two A*s in Art and Design and English Literature, and an A in French; to study History of Art and French at the University of Bristol. Sofia Palm from London achieved two A*s in Politics and Religious Studies, and an A in History; to study Social Anthropology at SOAS, University of London. Jack Merrett from London achieved an A* in History, and two As in Politics and Religious Studies. Isabelle Binney from Rogate achieved an A* in Art and Design, an A in Psychology, and a B in English Literature; to study History of Art at the University of Bristol. Lizzie Compton from Rake achieved an A* in History, an A in English Literature, and a B in Mathematics; to study Law at the University of Bristol. Henry McWhirter from Hindhead achieved an A* in History, an A in English Literature, and a B in Religious Studies. Eleanor Soper from Hambledon achieved an A* in Mathematics, an A in Physics, and a B in Chemistry; to study Chemistry at the University of Edinburgh. Alexander Yetman from Froxfield achieved a D2 (equivalent to A*) in Music Pre-U, and two Bs in English Literature and Design and Technology; to study Bespoke Tailoring at University of the Arts London. Sofie Kitts from Swanmore achieved three As in English Literature, History and Spanish; to study Scandinavian Studies and History at The University of Edinburgh. Phoebe Landers from Headley achieved three As in French, History and Spanish; to study History at The University of Edinburgh. Laura Wise from South Harting achieved three As in English Literature, History and Religious Studies; to study Philosophy and English Literature at The University of Edinburgh. Lily Brown from Liss achieved two As in Biology and Classical Civilisation, and a B in Art and Design. Victoria Burnell from Sheet achieved two As in Economics and History, and a B in Classical Civilisation. Saskia Church from Brentford achieved two As in Design and Technology and Psychology, and a B in Economics. Jack Shannon from Steep achieved two As in Biology and Mathematics, and a B in Chemistry; to study Marine Biology at the University of Southampton. Maya Wilson from Rowberrow, Somerset achieved an A in English Literature, a D3 (equivalent to an A) in Music Pre-U, and a B in History. Emily Blackley from Priors Dean achieved an A in Biology, and two Bs in Geography and Mathematics; to study Biological Anthropology at The University of Kent. Gabriel Curry from Steep achieved an M1 (equivalent to an A) in Music Pre-U, and two Bs in Mathematics and History; to study Law at the University of York. Ruan Evans from Wimbledon achieved an A in Dance, and two Bs in Drama and Theatre Studies, and History. Foxey Hardman from Langport, Somerset achieved an A in Psychology, and two Bs in Drama and Theatre Studies, and French. Radheka Kumari from Ruislip achieved an A in English Literature, and two Bs in History and Religious Studies. Enrico Luo from Guangdong, China achieved an A in Mathematics, and two Bs in Physics and Design and Technology; to study a Foundation Diploma in Art and Design at City College Brighton and Hove. Robert Murray from London achieved an A in Mathematics, and two Bs in Physics and Computing. Lydia Nethercott-Garabet from Steep Marsh achieved an A in Latin, and two Bs in History and Spanish. Matilda Raphael from Richmond achieved an A in Psychology, and two Bs in English Literature and Drama and Theatre Studies. James Sweet from Henfield, West Sussex achieved an A in Mathematics, and two Bs in Biology and Chemistry. Lily Wetherill from Midhurst achieved an A in Art and Design, and two Bs in Design and Technology and English Literature. Cambridge Pre-U D1 and D2 grades are equivalent to an A*; a D3 is equivalent to an A; M1 is equivalent to an A grade and M2/M3 merit grades are equivalent to B grade. Note that this data is provisional and subject to re-marks.